In 1559, King Henry II of France was participating in a jousting tournament, one of his favorite sports. In a match against the captain of his Scottish Guard, Gabriel Montgomery, Henry was pierced through the mask of his helmet by Montgomery's lance and lingered for ten days in severe pain before dying. 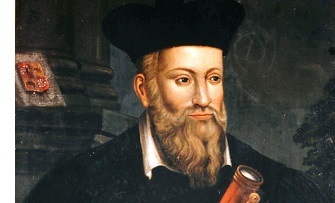 Many felt Nostradamus' quatrain was an accurate prediction of Henry's death and probably contributed to the large following which he maintains to this day.